Price: Varies because it's a public funded facility. Grants are available. Originally opened on November 7, 1927 as a vaudeville house, the Orpheum was the largest and most opulent theatre on the Pacific Coast. 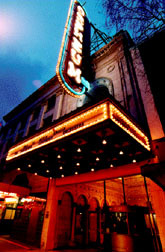 The City of Vancouver purchased the theatre on March 19, 1974 and undertook a complete restoration of the theatre’s interior. The Orpheum re-opened on April 2, 1977 as the permanent home of the Vancouver Symphony Orchestra and a restored concert hall that hosts a variety of pop, classical, choral and chamber recitals. It is also an ideal venue for concert recordings, conference sessions, seminars and film shoots.